Listen to Brenda as never before as she delights a spellbound live audience in Paris with new arrangements of familiar songs, together with some never previously recorded tracks. The discovery of the master tapes of this concert, recorded in 1984, has provided the material for the first new album by Brenda in fifteen years and marks a significant time when she was at the peak of her musical career. 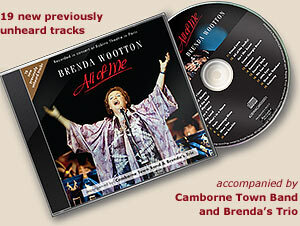 It's unique, as it is the one and only time Brenda has recorded before a live audience and confirms that as a singer from Cornwall she has no parallel. This collection of songs has put her back into the spotlight for a 'final', captivating performance. This album is a rare combination of material about Cornwall, romantic ballads, jazz and blues, but mostly it's for anyone who loves Cornwall. It's nostalgic to those who remember Brenda singing in local folk clubs and, internationally, at festivals and concerts across the world, and is relevant today to a new audience, as Brenda's voice and repertoire distinctively captures the essence of her 'country'. 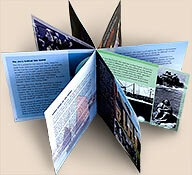 This souvenir booklet is a cameo in photographs and facts about Brenda's musical life and times. From her early days at folk clubs in Cornwall to star billing in Paris. The photographs that appear are mostly unpublished images and some are from Brenda's own personal family collection.